As near-torrential rain fell onto the Shawbridge pitch during kick-off, Stuart Mellish’s side were feeling as gloomy as the weather by 5pm, after they crashed out of the FA Cup at the first qualifying round, following a heavy defeat at the hands of unbeaten Greater Manchester side, Mossley AFC. Despite Clitheroe heading into the game with back-to-back wins against Leek Town in the league and Sunderland RCA in the previous round under their belts, Mossley began the game the brighter, as they took an early lead after scoring within thirty seconds of the referee’s opening whistle. A long-ball forwards caught out the Clitheroe backline as Mossley’s Liam Ellis did well to find his forward, Max Leonard, who had made a darting run through the defenders, before quickly diverting the low cross past Wilczynski, who was left despairing at his near-post, as Mossley wheeled away into early celebration. Determined not to miss out on the euphoria, Clitheroe tried a similar tactic from their kick-off, as they got the ball forwards quickly, to try and level the scoring. That quick leveller soon came, courtesy of Jacob Gregory, who donned the number 7 shirt for this fixture. The midfielder, placed the ball on the edge of the area, after Mossley had conceded a free-kick due to a handball, before driving in a low free-kick, which had both the Mossley wall and goalkeeper beaten, as the scoreline was quickly equalled at 1-1. On the 7th minute, Mossley had their second chance of the game, which saw their captain, Andrew Keogh, link-up well with Max Leonard before Keogh released a shot that ballooned over Wilczynski’s goal. Although, by the 11th minute, Clitheroe managed to gain a considerable foothold in the game, their progression was soon halted as Mossley re-took the lead, after Jason Jeffries gave away a free-kick inside his own half. Mossley’s number 2, Benjamin Richardson floated in the free-kick which was subsequently headed towards goal. The header brought a good reaction save from Wilczynski, but the rebound was tapped home by Liam Ellis, who put the away side ahead, for the second time in the game. The next noteworthy attempt at goal didn’t come until the 20th minute, as a good spell of Clitheroe possession ended in a Jacob Gregory shot flying wide of the mark. Following on from that missed opportunity, the first substitution of the game, came Mossley’s way, as Michael Fish, who went down injured during play, was replaced by Ben Halfacre. Mossley earnt a free-kick soon after the change, which resulted in the first – and only – booking of the game, as Macauley Harewood entered referee Anthony Tankard’s book, following a forceful challenge. After Clitheroe regained possession from the Mossley set-piece, the Blues crafted an opportunity, which resulted in the bar being struck. On the 33rd minute, a corner was floated in, as Derek Ubah headed towards goal. His header bounced off a defender and rebounded to Jason Jeffries, who struck a sweet volley that cannoned off the crossbar, before being cleared. With five minutes to go, until the break, Stuart Mellish’s side upped their game, as they went looking for the equaliser that would change their manager’s half-time words of wisdom. Their second equaliser of the game again came from Jacob Gregory’s good play. The number 7, who was arguably, Clitheroe’s best player on the day, produced a good save from goalkeeper Jonathan Diba Musango. Although Musango tried to divert the ball away from goal, the rebound fell back to Gregory who again equalled the scoring, at 2-2. The first-half soon ended, after three minutes of added time were played, as both sides entered their respective dressing rooms, wondering how the scores were tied, following a plethora of chances from either side, throughout the first 45 minutes. As both sides remerged for the second-half unchanged, it didn’t take long for Mossley to capitalise on Clitheroe’s missed chances, as they took another early lead, to make it 3-2. On the 51st minute, Liam Ellis and Max Leonard combined again, before the latter’s low cross found substitute Ben Halfacre, who managed to turn the ball home. After taking the lead, Mossley extended their advantage on the 58th minute to make it 4-2. A cross was floated into the box and not dealt with by Wilczynski, who elected to punch the ball, rather than claim it. Max Leonard of Mossley’s frontline, connected to the loose ball with a volley from the penalty spot, that lashed into the net, to send the travelling supporters wild. As Clitheroe tried to breakdown the resilient Mossley defence, the next notable chance came with 65 minutes on the clock. Jacob Gregory again tried for his hattrick, but his effort could only produce a fine save from Musango. 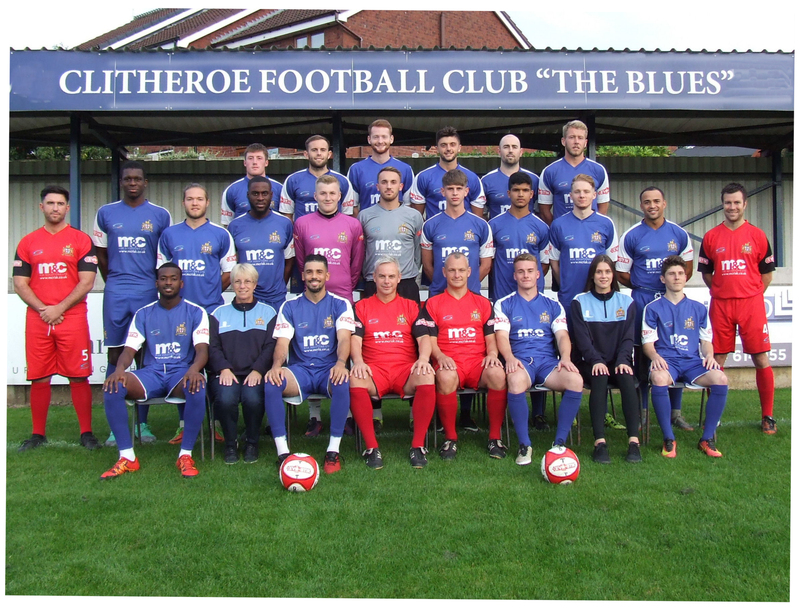 The Blues’ pressure continued, as on the 71st minute, Max Hazeldine and James Sloane combined for Clitheroe, with the former flicking the ball into the path of the latter. With Sloane racing through on goal, despite being challenged by a Mossley centre-half, the Clitheroe number 9 did his best to direct his shot towards goal, but he could only drag his effort wide. Four minutes after Sloane missed the target, Mossley nearly grabbed a fifth. A cross into the Clitheroe area, was met by Adam Jones, who headed the ball towards Ben Halfacre, as the latter’s point-blank header fell straight into the arms of Clitheroe shot-stopper. With the clock ticking down towards 90 minutes, Mossley made two changes, which were only a minute apart, as Stephen Mason and Max Leonard were withdrawn and replaced by Matthew Kay and Logan Jeffs, respectively. Prior to the addition of five minutes onto the end of the game, Derek Ubah again had a chance to reduce the deficit. Antoine Recizac’s corner, saw the centre-half connect with the ball. Unfortunately for the defender, his missed chance summed up the poor afternoon for the Blues, as he couldn’t repeat the goalscoring antics that saw him win the game against Leek Town, a week ago, as his header flew over. The final act of the game was another unfortunate disappointment for the home side, as Mossley killed the game off at 5-2. With everyone bar Harewood and Wilczynski, forward for Clitheroe, Mossley broke on the counter, as some solid interplay saw the ball end up at the feet of Ben Halfacre, who had the composure to dribble past Wilczynski and slot the ball home, into the net. With the FA Cup adventure at an unfortunate end, the next test for Mellish’s men, comes on Tuesday, as they welcome joint-second highest goalscorers, Atherton Colls, to Shawbridge, for the next fixture in the Western Division.